Stephan Kareem El Shaarawy (Arabic: ستيفان كريم الشعراوي‎; born 27 October 1992), is an Italian footballer who plays as a striker for Serie A club Milan. He is nicknamed Il Faraone (The Pharaoh) by his fans. El Shaarawy started his career at Genoa. He was signed by Milan because of his brilliant performance when he was loaned out to Padova. He became the key player in Milan since the move of Zlatan Ibrahimović to PSG. In 2012, El Shaarawy was listed 52nd in The 100 best footballers in the world by The Guardian. El Shaarawy is a current member of the Italy national team and Italy U21 national team, having represented his nation at Italy U17 national team and Italy U19 national team. He made his senior international debut in August 2012, in a friendly match against England. Three months after his international debut, El Shaarawy scored his first international goal against France in November 2012. Stephan El Shaarawy was born in Savona to an Egyptian father and an Italian mother. He is a Muslim, although doesn't speak Arabic or observe Ramadan, and admits to "feeling Italian". 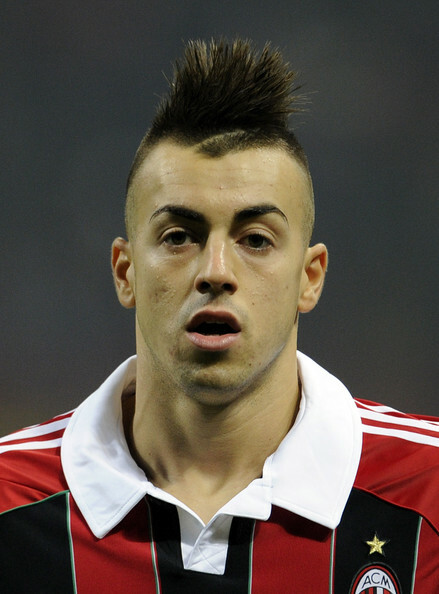 El Shaarawy started his youth career in regional Serie A club, Genoa at the age of fourteen. On 21 December 2008, when he was 16 years and 55 days old, he made his first team debut, playing ten minutes in a Serie A away match against Chievo, becoming the fourth youngest player in the history of Serie A.It was his only appearance of the season despite making the bench many times. In June 2010 he was loaned out to Padova for the 2010–11 Serie B season. In his loan period at Padova, he quickly emerged as a key element for the team, leading the Venetian club to the promotion playoff finals where they then lost to Novara. He was awarded Serie B Player of the Year in 2011 as his glowing performance in Padova. On 25 June 2011, El Shaarawy signed for Serie A giants Milan. On the 18th September 2011, El Shaarawy made his debut with Milan at the Stadio San Paolo in a 3-1 loss to Napoli in Serie A. Three days later, after coming on as a substitute for the injured Alexandre Pato, he scored his first goal for the club, earning his team a 1-1 draw at home against Udinese. In his first six months at Milan, he made a total of seven appearances leading to reports in the media that he may be loaned out for more playing time to help his progression. However a decision was made between Adriano Galliani, Massimiliano Allegri and himself to stay at the club for the near future. It was then that his performances for Milan began to improve and have led him to becoming one of the most highly rated youngsters in Italy. On 8 February 2012, El Shaarawy scored in a 1-2 loss against Juventus in the first leg of the 2011-12 Coppa Italia semi-final. Three days later, he scored an immensely vital winner against Udinese. On 25 July 2012, El Shaarawy signed a contract extension, which will keep him with the Rossoneri until 2017. On 3 October 2012, he scored his first goal in UEFA Champions League against Zenit, thus becoming at the age of 19 years and 342 days, AC Milan's youngest ever goalscorer in the competition. He scored two goals in a derby against Napoli to save Milan from losing an important game. El Shaarawy continued his fine form by scoring two more goals in a match against Catania, which ended 1-3 in favour of Milan. He then added a 76 minute goal in the thrashing 4-2 win over Torino FC and another in a 4-1 win over Pescara Calcio which contributed in Milan 4th consecutive win and up rising of the season. He finished the first half of the season as Serie A top scorer with 14 goals and also as AC Milan top scorer in all competitions with 16 goals. El Shaarawy assisted Muntari to score the second goal, in a 2–0 home victory over Barcelona on 20 February ahead of the 2nd leg in the Champions League Round of 16. Initially he was qualified to play for the Egypt national football team, but was denied by then coach Hassan Shehata stating that "not every Egyptian playing for a foreign league qualifies to play for the national side" as the Egyptian side then was very successful with 3 consecutive African Cup Of Nations wins and performed well in the 2009 FIFA Confederations Cup. El Shaarawy then started playing with the Italy U-17 team, he took part at both the 2009 UEFA U-17 Euro and the 2009 FIFA U-17 World Cup.